Have you done Weigh Down Basics, read the Tablet and yet you still want more? Do you ever question the direction of your life and its' meaning? What do you treasure and what is your purpose? 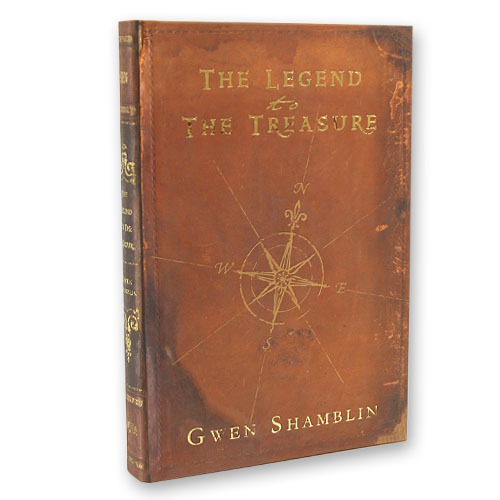 The Legend to the Treasure addresses these heartfelt questions and points the reader to introspection and renewal through powerful Biblical teachings symbolically portrayed through sea voyage, ship and sea navigation terminology. The purpose of this book is to thoroughly examine every aspect of your life and experience the freedom of finding life's greatest Treasure. If you are willing, you are about to turn your wandering ship around and embark on a voyage that will take you to peaceful shores. Finally, this book is full of contrasts- from fortune to disaster. You will discover that there is no in-between. To find the real Treasure, you need to pull out every spiritual "nautical tool" that you can find, check the rigging, and hoist the sails...and finally, you have to sail directly into the wind under the guidance of a true Captain. This book is a must read for every seeker who is longing to make their peak contribution on earth and successfully sail to the to other side of eternity. This book/class was my absolute favorite!!!!! Weight has not been my main struggle. This class really helped me get out of self-pity and turn my ship around to glorify God during a time that I was struggling! from Indianapolis Incredible Perspective Change! YES! I want more!!! This class is such an obvious answer to my prayers as evidenced by the incredible changes and growth that are taking place in my heart and life. My family is taking the "Legend to the Treasure" Class together again this fall and I am struck at the miracle of being able understand not only what God wants, but how to change even more to please Him. I LOVE to make God smile...what an incredible GIFT to see what I've been doing wrong, and know how to change. The results are nothing short of amazing. I feel so refreshed and excited to be on this "Treasure" hunt with God. Most of all I feel God's pleasure, and my prayer life is knocking my socks off. I read this book when I was at a pivotal turning point in my life. I had just graduated high school, and I was discovering who I was, what my purpose in life was. I would often think about how BIG the world is, how VAST the universe is, and I would contemplate what man's existence was, why we were here. . .I found answers and fulfillment in God, and this book showed me the way to Him. The book compares the journey of life to a treasure hunt, with a Relationship with God as The Treasure. It describes the pain of the world and tells how to find Freedom, Hope, and Inexpressible JOY: Seek GOD first, align my will with God's (just as Jesus did), and everything else will be given back, and life will be worth living!! This book helped me get on the right path in my search for a relationship with God, and my life has never been the same!! The principles in this book have influenced every area of my life, for the better, and continue to help me get closer to God, which makes my life GLORIOUS!! from Williamsburg Its new with every read!! The treasure book is one I refer to often. As all of these Weighdown materials are meant to be LIVED--- I practiced what Id learned, and it gets deeper, God shows this information in a new light. Gwen Shamblin discusses Death, authority, laying down sin, and having a connection with God and man with brilliant and wise words, but words that anyone who is seeking a relationship with God can understand . I have put into action what Ive learned and my life has been enriched and I feel God smile on me!!! Please add this to your collection. Youll be richly rewarded!!!! This book changed me in every way possible. Out of all the Christian "self-help" books that I've read, this one book gave me insight into some very difficult and painful life experiences, which had haunted me for years. Thru the teachings of this book, I have found Peace from God.